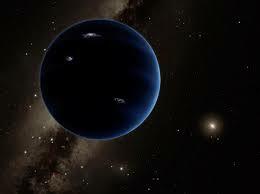 There may be a ninth planet in the solar system, after all. Earlier today, it was announced by astronomer Mike Brown of Caltech, among others, that there might be a planet 10 times more massive than earth orbiting the Sun in the far-off Kuiper Belt at a distance more than 20 times farther than Neptune. The existence of this dark, far-away world was hypothesized by analyzing irregularities in the orbits of distant Kuiper Belt objects, which seem to suggest that there is interaction with some large, as-yet unseen body. For, Brown, this finding would be both ironic and vindicating as Brown was the astronomer who discovered Sedna, the body Brown initially believed to be the 10th planet at discovery. 30% more massive than Pluto but over 3 times more distant, Sedna never held the status of 'planet' despite being bigger than Pluto. Why? When it was discovered in 1930, Pluto was thought to be alone. By 2005, Sedna was known to be one of hundreds of Kuiper Belt objects (KBOs), which raised a question: how could the bigger of the two bodies not be a planet while the smaller one was a planet? End result: the word 'planet' was defined for the first time, Pluto was demoted to 'dwarf planet,' and Neptune became the outermost planet in the solar system. This hypothetical Planet Nine, if confirmed, is no dwarf based upon the evidence being used to make a case for its existence. According to the research paper, six KBOs orbit the sun on elliptical paths that all point in the same direction. The kicker that provides evidence for a massive planet? All six bodies are moving at different speeds and they all share the same tilt, roughly 30 degrees down relative to the ecliptic plane, on which all 8 planets orbit the Sun. According to the scientists, the odds of this occurring by random chance is 7/1000. Additionally, the team used other possibilities to explain the orbits of these 6 oddball KBOs, namely interactions with other KBOs. In the end, such calculations didn't match up with the observations, but when the numbers for a 10-Earth mass planet were put into the equation, the model worked much better. In addition, the existence of such a large body could also explain orbital oddities in Brown's Sedna and another large KBO, 2012VP113. In speaking to the press, Brown said that not only did Planet Nine kill two birds (the 6 oddball KBO orbits and oddities for Sedna and 2012VP113) with one stone, but also a third that they didn't even know about, namely the absence of a between Earth and Neptune-size planet, now known to be the most common size in the cosmos, in our own solar system. As of now, the orbit for this hypothetical planet has been calculated and the hunt is on to spot it visually. Brown has said that he would like to be the first to make visual confirmation but will be okay if another team beats him to it because this finding could be the impetus for a whole new generation of planet finders to go to the telescopes and begin searching the skies. Hopefully, someone will visually confirm this planet's existence sooner rather than later.